As the daytime temperatures start to climb, working outside becomes harder and keeping cool becomes a top priority. In order to make the heat more bearable the use of cooling technology such as E-cool becomes an essential part of the workplace from both a comfort and safety aspect. Elliotts E-Cool® range of products helps you stay cool in hot situations. 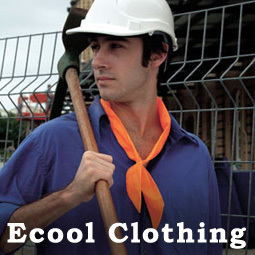 The E-Cool® range includes caps, vests, bandanas and hard hat/helmet inserts that fit inside your hard hat/helmet and helps keeps your head cool and thus your core temperature. TheE-cool range is easy to use, just soak in cold water for 30min before use. The insert stays hydrated for up to several days and stays cool even in the hottest conditions. The E-cool products are re-usable - hundreds of times and work without freezing or ice. By reducing the heat stress on the body through cooling clothing such as E-cool allows workers to concentrate on the task at hand and minimise heat stress related accidents. TheE-cool range includes vests, bandanas, helmet inserts and caps to protect you from the extremes of hot environments in the workplace. E-Cool® Bandana - The E-Cool® neck bandana keeps your neck cool and thus your core temperature. E-Cool® Hard Hat Insert - The E-Cool® hard hat insert fits inside your hard hat and helps keeps your head cool and thus your core temperature. E-Cool® Cap - The E-Cool® cap keeps your head cool and thus your core temperature. E-Cool® Vest - The E-Cool® Vest has strategically placed E-Cool crystals which keep your upper body cool. The vest has a zip closure and elasticised sides and base to keep it close to ensure a close fit. The E-Cool® range of products helps you stay cool on hot summer days.